Alright, I know I should be seeking out healthier food – whole fruits and vegetables, etc…. 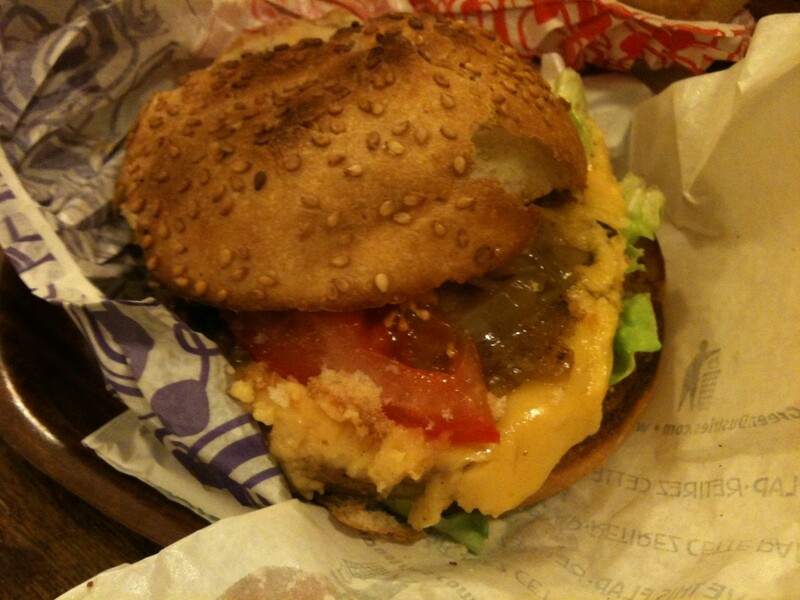 but I couldn’t resist trying the vegetarian/vegan burger place now open in Paris. It’s been a while since I’ve had a veggie burger. I think the last one was at Real Food Daily in Los Angeles last year. mmmmm. Well anyway, I had to try one here. I opted for the vegan version (just ask!) so my cheese was dairy-free. And I couldn’t resist having a hotdog too. It’s been even LONGER since I’ve had a hotdog and I kinda remember liking them as a kid. I mean if you think about them, they’re pretty disgusting, so I haven’t had one in ages. I was very happy to have a veggie dog. So happy. So I ate one. With relish. no, really. With relish. So I took some pictures of my food, which I will share here, but be warned, it ain’t as pretty as some of the other places I’ve gone. Of course, sometimes I have my big camera with me and sometimes only my phone. This was a phone day. 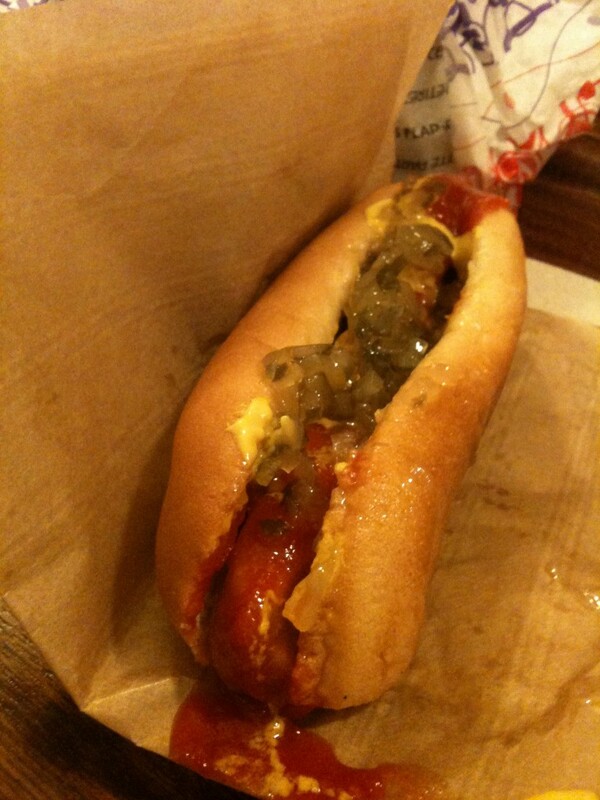 Anyway, I was happy with my burger and my hotdog, though the second time I went (yessss) I only got a hotdog. And fries. The fries weren’t anything special, but I enjoyed the hotdog again. It’s a cute little place, with seating downstairs and a small table outside if you prefer that. They also sell cookies and desserts, and I gasped when I saw vegan gummy bears near the register. Next time. I will eat you. I would recommend checking them out if you want a cheap vegan meal. They’re near métro stations Richard Lenoir and Saint-Ambroise. You can find their menu here , which is a better idea than me listing prices, because they could change. They are not open Sunday and Monday, and have pretty early closing hours too, so think ahead!